While the bathroom may occupy minimal square footage in your home, the area has been known to waste a lot of energy. Water is one of the biggest culprits that can make a huge dent on your carbon footprint. Fortunately, there are affordable fixes to a greener bathroom without breaking the bank. There is more to a “green” bathroom than selecting colors that make you feel good. Going “green” also means you want to do everything you can to help the planet by limiting the energy you use and re-purposing the items within the room of your home. If you’re looking to gut your bathroom, recycle materials and put them in other areas of your home. You may also purchase new materials from a store specifically recycled such as countertops, showers, baths and flooring. Another low emission material ideal for a bathroom is recycled glass tile. If you have unused cabinets, drawers or dressers in an attic or storage closet, you can implement them in your bathroom to house towels or bathroom sinks. The average household may use up to 100 gallons of liquid per day. Most of the water used in the bathroom is through flushing toilets, showers and baths. Energy is also wasted to heat the water. You’ll find this plumber in Lakewood, CO offers customers the opportunity to retrofit their home with energy and water efficient gadgets and appliances. If you’re looking to reduce your water consumption drastically by as much as 30 percent, you can start by having them install low-flow showerheads. Low-flow toilets also use less water with every flush. Another handy gadget you may want to consider if you have a garden or orchard is a greywater system. The handy valve sends the water you used during your shower and bath into a collection bin. Once the water is collected, you’ll be able to water your flowers and vegetables during the growing season. Ensuring that you have adequate lighting in the bathroom can be great for grooming. It’s also a necessity to prevent slips and falls. But the wrong lighting can be bad for the environment and cause your utility bills to skyrocket. If you’re looking to reduce energy by as much as 80 percent, you want to replace your bathroom lighting with LED bulbs. The “green” bulbs also last approximately 25 to 30 times longer than the regular variety. Changing the color of your walls is a great way to freshen up your dwelling without spending a lot of money. But if you’re looking to renovate your bathroom, you want to pay attention to more than just the color. Certain paints are high in VOCs, a toxin emitted from the paint. They can also be harmful to the occupants in the home, especially if you suffer from asthma or allergies. If you’re looking for a product that is environmentally-friendly, you want to consider the advantages of low VOC paint. Made from water and not petroleum-based, you want to check the label on the paint can for the VOC level before purchasing. Other simple fixes to update a bathroom and reduce your carbon footprint includes your linens and shower curtains. If you’re looking for comfort, softness and safety, organic cotton hits the mark. Although a touch higher in price, the materials use less pesticides to make than your average towels made from cotton. The dyes used to color the towels are also less toxic and made using natural materials. Heavy organic cotton shower curtains are also better than the plastic variety. The toxic ingredients used in the plastics can emit chemicals in the air for your family to breathe. Your storage cabinet may house some of the most harmful products for the environment. Cleaning products are toxic and dangerous to the environment and occupants of your dwelling. Read the warning labels before using items to clean your home. If they contain words of “caution” or “danger”, ditch the products. Lemon juice, baking soda, vinegar and dish soap are natural products for the bathroom that can help kill germs, mold and mildew. Essential oils are also non-toxic and natural ways to clean important areas such as the bathroom. 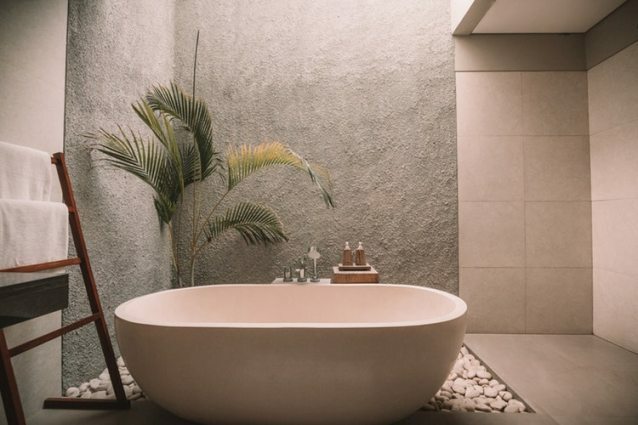 Eucalyptus, tea tree, peppermint and rosemary oils can clean areas of the tub, shower and sink efficiently when added to baking soda and water. There are also cleaning products on the market today geared for a “green” home. The bathroom is a room in the home that your family spends a great deal of time in. It’s also an area where a lot of energy and resources get wasted. Through the above simple fixes, you’ll be able to reduce your carbon footprint and provide your family with a safe and non-toxic setting.